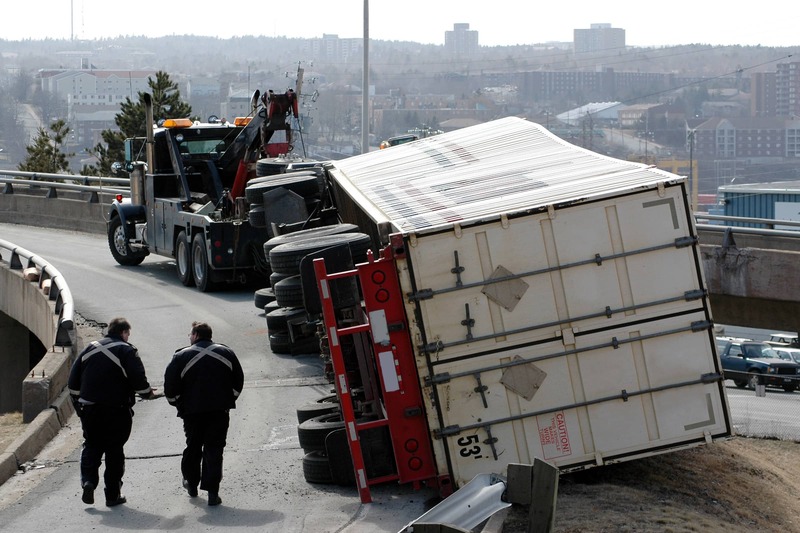 Tractor-trailers are generally low-stability vehicles with a high center of gravity; their structure makes them particularly susceptible to rollover crashes. Unfortunately, when these factors are coupled with a combination of unsafe driving behaviors (usually steering input and speed), as well as gravity, it is easy to see why commercial motor vehicles can become destabilized and roll over. For this reason, let’s examine common causes of rollover crashes and prevention techniques. Excessive speed around ramps, curves, and turns is a common cause of rollovers. Improper speed for conditions and vehicle instability can initiate a rollover sequence, leaving the driver little opportunity to recover. That is why prevention is so important. On ramps, curves, and intersection turns, drivers need to slow down going into the maneuver since the speed limits posted are for passenger vehicles, which have a lower center of gravity. Once in the curve, the driver can apply the throttle to pull the trailer through the curve. Drivers should apply this maneuver through all ramps, curves, and intersection turns. Next, rollovers are common when drivers use excessive speed in slippery conditions. This is common in winter driving but can occur at any time of the year. Rain, snow, and ice cause very slick road conditions, and the risk of losing traction is greater when driving in these conditions. Dust, sand, dried leaves, and gravel also create adverse conditions. If vehicles lose traction, drivers can lose control and the vehicle can skid off the roadway, likely overturning when hitting the berm of the roadway or tipping over as a result of the steep drop-off or ditch. Reducing speed is the best preventive measure against losing traction. Be sure to leave plenty of stopping distance from the vehicle in front, and slow down well ahead of off-ramps to prevent wheels from locking up and sliding. In addition, always be alert to obstacles in the roadway, such as animals, oncoming traffic, and construction barrels, to name a few. Avoid swerving and over-correcting to avoid obstacles, as those actions can lead to loss of control and possibly a jackknife and/or rollover. Sudden maneuvers such as these can also cause cargo to shift, especially liquid commodities that may slosh and surge. Finally, pre-trip planning is crucial. For starters, ensure cargo is secured properly and understand the nature of the load. If the commodity has a high center of gravity, like hanging beef, be extra cautious around turns, curves, and ramps. Next, be sure equipment is in good working order. The pre-trip inspection should include a thorough examination of the tractor and trailer, with particular attention given to the brakes, tires, and suspension system. Note any deficiencies and have them corrected before leaving. Likewise, be mindful of known hazards on the designated route, such as areas prone to high winds or fog. In addition, remove in-cab distractions so attention is completely on the task of driving. Program GPS and radio stations beforehand, and put cell phones away. Be well rested, and plan the route to allow rest break. Recognizing the factors that contribute to rollover crashes and applying these prevention techniques can go a long way to saving time, money, and lives. This material is intended to be a broad overview of the subject matter and is provided for informational purposes only. Great West Casualty Company does not provide legal advice to its insureds or other parties, nor does it advise insureds or other parties on employment-related issues, therefore the subject matter is not intended to serve as legal or employment advice for any issue(s) that may arise in the operations of its insureds or other parties. Legal advice should always be sought from legal counsel. Great West Casualty Company shall have neither liability nor responsibility to any person or entity with respect to any loss, action, or inaction alleged to be caused directly or indirectly as a result of the information contained herein. Click It or Ticket: Make Seat Belt Use a Daily Habit Get the Facts: Move Over. It's the Law.